One of my dream projects when I started my interest in portrait photography was to shoot different people in different parts of Singapore. It was one of those ideas that I had at the back of my mind that I wanted to eventually pursue as a personal project. Fortunately, I got to do exactly that on a commissioned shoot. I was contacted a few months ago by Jeremy from Singtel‘s marketing department. He was wondering if I’d be interested to meet up and discuss a possible collaboration. Of course, I said yes. He presented to me his project of creating an online publication for expats here in Singapore… it was called NotaTourist.sg It was a site where expat writers could blog about their experiences in Singapore, something other potential expats could find useful in making this place their new home. They hired Pat Law / Goodstuph to be their consultant, and Ogilvy Interactive to develop the site. I remember saying “Between Pat Law and Ogilvy, I’d say you’re in good hands!” Jeremy wanted me to be one of the expat writers/contributors for the site. I said yes. A few weeks later, Jeremy contacted me again. They wanted to commission me for a photo series involving expats completing the statement “I’m not a tourist because…” The idea was to portray each expat in a location based on their quote or favorite hang out – giving a broader picture of Singapore beyond the usual tourist spots. I was very excited with the project. After a few discussions with the guys from Singtel and Goodstuph, we’ve finalized on the concept, execution, and schedule. One of the challenge I had was the perspective of the portraits. My past portrait work focused on the face, thus I was comfortable with close up head shots with a blurred background (like my work for BBH and McAfee). However, for this project, I had to incorporate a lot of the background to establish the relationship with the subject and the location. My beloved 85mm f1.4 workhorse of a lens was not an option. Enter my new sidekick, the Nikkor 24mm f1.4 – this baby lets me capture more of the background, and delivers a punch even in low light situations. It’s a bit pricey, but i’s a worthy investment. Another challenge was finding a spot with good background and good light for each location. I preferred not to use strobes because it could limit our choice of locations and I didn’t want the subject to get uncomfortable… we tried to be as quick and discrete as possible. Again, my 24mm f1.4 lens came into play as it gave me more leeway with the available light conditions particularly when shooting indoors and at night. We had 18 expats listed for the series, which meant we had to shoot in 18 different locations in a span of 2 weekends. It was like discovery weekends for me – I seriously learned a lot of non-tourist stuff about Singapore from these guys. Bec moved here with her husband from Australia early this year. 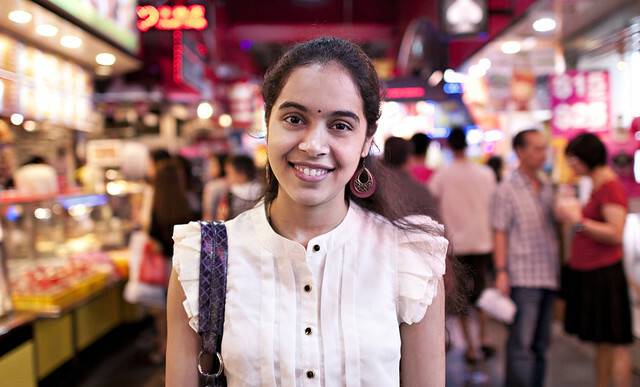 She says “I’m not a Tourist because I know where to get the greatest bargains at any time of the day.” Mustafa is a huge 24-hour mall located in Little India. You can buy just about everything from the place – from shoes, spices, electronics, jewelry… everything. 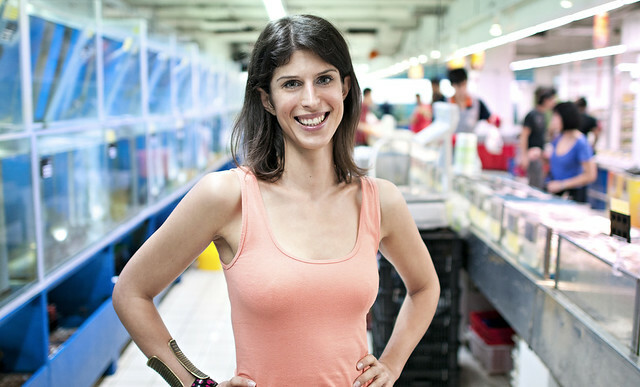 Victoria is the editor of NotaTourist.sg and hails from New York. Her quote was “I’m not a tourist because I have the taxi booking app for those mysterious times when cabs disappear until just before midnight.” I photographed her literally right in the middle of Orchard Road on the pedestrian crossing while the green man was on. We should have asked her not to wear heels coz we were running for the sidewalk each time the green man turned red. Leone is from Australia and has been here with her husband for 4 years. It’s funny that she’s more familiar with the MRT routes than some of the locals. Her quote is “I shop local. I eat local and live local. 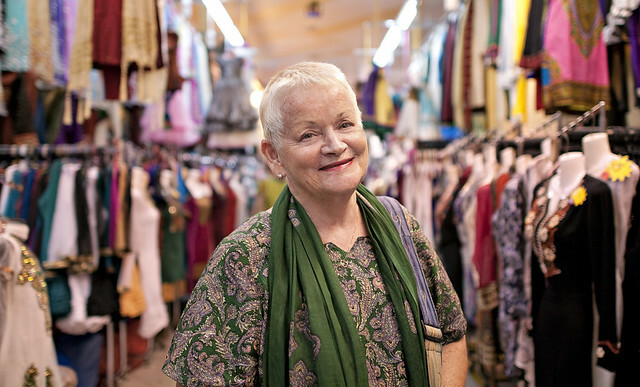 I even tailor-make my clothes local.” Yup, she had 24 complete outfits and a few tops through Sai’s Tailoring at Tekka Market in Little India. Laura moved here from the UK last year. Her quote was “I’m not a tourist because I know there’s more to the city than Orchard Road and the quays.” As much as I love Orchard, she’s right. One of her favorite places to relax is East Coast Park. Antonio is an Italian moved here in 2006. He’s a software programmer by day and a food blogger by night. 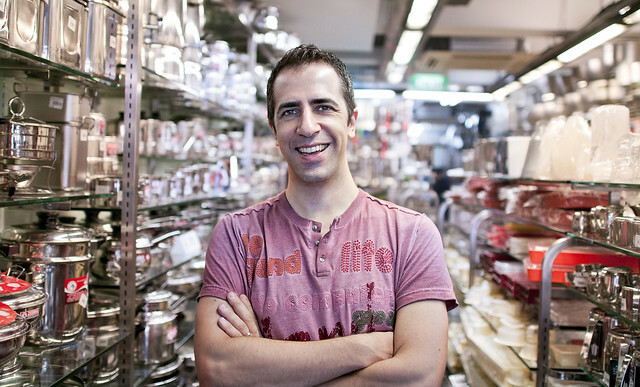 He also has a passion for cooking, that’s why his quote is “I buy my kitchen utensils at Sia Huat.” It’s a store in Chinatown where you can probably but anything and everything you’ll need in the kitchen. 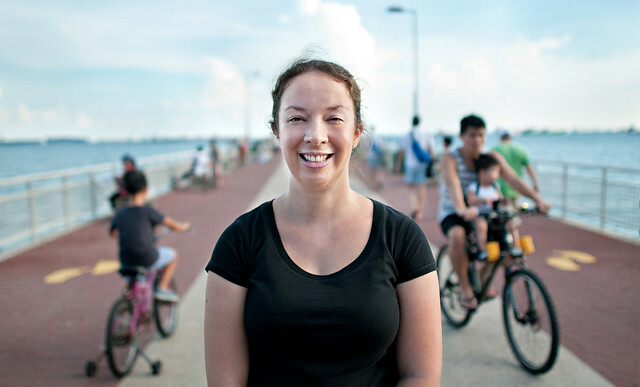 Anja is a Dutch who loves dancing, teaching, and DJing argentine tango. 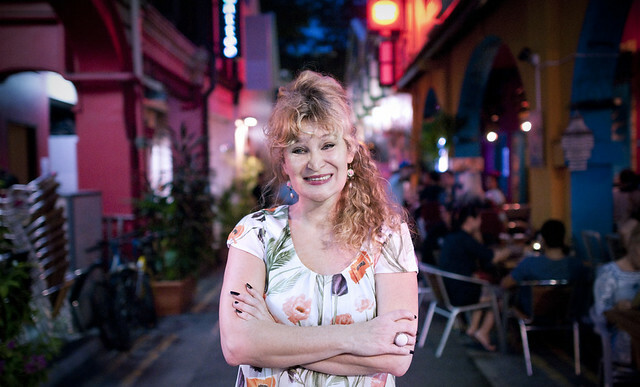 She has an inkling towards all things creative and loves to “… hang out where the locals hang out, with my bff, who is also a local.” Her photo was taken beside Piedra Negra in Haji Lane. 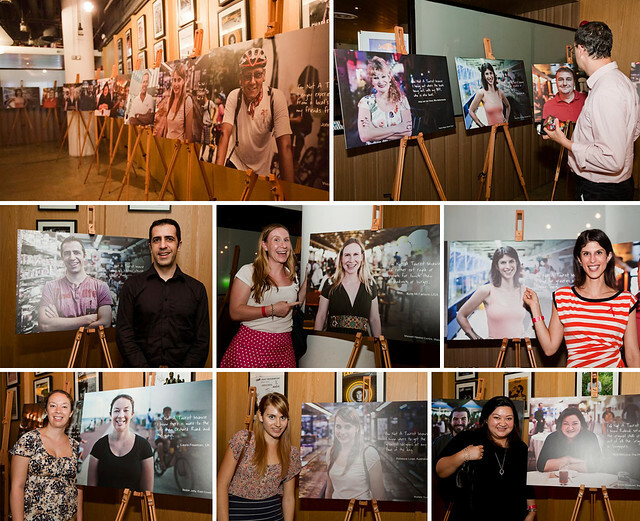 At the launch event of NotaTourist.sg held at TAB, I was surprised to see the photos printed out large and lined up at the entrance for all the guests to see. My girlfriend told me “… it’s like your own personal gallery!” It was pretty surreal. Of course it didn’t last coz after the event, they let the expats take home their poster-sized portraits :) I got to meet again most of the expats I photographed, and it was a blast. Big big thanks to the marketing guys at Singtel: Jeremy, Kenn, and Pei Ni.. you guys are awesome! And to the girls at GOODSTUPH… Pat and Daphne, you guys are beyond cool. And of course, bigger thanks to the expats: Antonio, Chaithra, Naveen, Fritz, Anja, Bec, Kate, Talya, Laura, Matthew, Myra, Leone, John, Peter, Sammi, Flora, Jeff, and Victoria… you guys were so easy to photograph. Thank you! I have learn some excellent stuff here. Certainly worth bookmarking for revisiting. I wonder how a lot attempt you set to make this sort of wonderful informative site. whoah this weblog is great i love reading your articles. Stay up the great paintings! You understand, a lot of individuals are looking around for this information, you can help them greatly. I¡¦m now not certain where you’re getting your info, however great topic. I needs to spend a while finding out more or figuring out more. Thank you for great info I was in search of this info for my mission. I’m still learning from you, as I’m trying to achieve my goals. I definitely enjoy reading all that is posted on your blog.Keep the stories coming. I loved it! What i don’t realize is in fact how you’re not really much more smartly-favored than you may be now. You’re very intelligent. You know thus considerably relating to this matter, made me personally believe it from numerous varied angles. Its like men and women are not fascinated except it¡¦s one thing to do with Girl gaga! Your own stuffs great. At all times handle it up! I cling on to listening to the news talk about getting boundless online grant applications so I have been looking around for the finest site to get one. Could you advise me please, where could i acquire some? I would like to thank you for the efforts you’ve put in writing this site. I am hoping the same high-grade website post from you in the upcoming also. Actually your creative writing abilities has encouraged me to get my own blog now. Really the blogging is spreading its wings rapidly. Your write up is a great example of it. I will immediately grab your rss feed as I can’t to find your e-mail subscription link or newsletter service. Do you’ve any? Please permit me recognize in order that I could subscribe. Thanks. Hello, Neat post. There’s a problem together with your site in internet explorer, would check this¡K IE nonetheless is the marketplace chief and a big part of folks will leave out your excellent writing due to this problem. Thanks , I have just been looking for info about this subject for ages and yours is the greatest I’ve came upon so far. However, what concerning the conclusion? Are you certain concerning the source? I definitely wanted to send a simple word to be able to appreciate you for some of the fabulous points you are placing on this website. My time intensive internet research has at the end been paid with sensible knowledge to talk about with my family members. I ‘d mention that many of us readers actually are rather lucky to exist in a good site with very many brilliant people with helpful solutions. I feel quite lucky to have come across the webpage and look forward to some more excellent moments reading here. Thank you again for everything. I simply want to tell you that I’m very new to blogs and truly loved you’re web blog. More than likely I’m want to bookmark your site . You certainly come with fantastic stories. Many thanks for revealing your blog. Good ¡V I should definitely pronounce, impressed with your site. I had no trouble navigating through all the tabs as well as related info ended up being truly easy to do to access. I recently found what I hoped for before you know it at all. Quite unusual. Is likely to appreciate it for those who add forums or anything, site theme . a tones way for your customer to communicate. Excellent task.. I just wanted to construct a simple note so as to thank you for all the superb suggestions you are writing on this website. My time-consuming internet investigation has finally been recognized with pleasant know-how to talk about with my company. I would point out that many of us visitors are really blessed to exist in a very good place with many marvellous professionals with good tactics. I feel very grateful to have seen the web site and look forward to plenty of more amazing times reading here. Thanks once again for everything. I’m still learning from you, while I’m trying to achieve my goals. I certainly love reading all that is posted on your site.Keep the tips coming. I enjoyed it! Fantastic goods from you, man. I have understand your stuff previous to and you’re just too magnificent. I really like what you’ve acquired here, really like what you are stating and the way in which you say it. You make it enjoyable and you still take care of to keep it smart. I can’t wait to read much more from you. This is actually a wonderful website. Great awesome things here. I am very satisfied to peer your post. Thanks so much and i’m having a look forward to contact you. Will you kindly drop me a mail? Thanks for all your effort on this site. Gloria enjoys working on research and it’s easy to see why. My partner and i hear all concerning the compelling manner you give functional guidelines via the website and even boost participation from other people on the topic while my simple princess has been being taught so much. Enjoy the remaining portion of the year. You have been performing a pretty cool job. Valuable info. Fortunate me I found your site by chance, and I am surprised why this coincidence didn’t happened earlier! I bookmarked it. hey there and thank you for your info – I’ve certainly picked up anything new from right here. I did however expertise several technical issues using this website, since I experienced to reload the site lots of times previous to I could get it to load properly. I had been wondering if your web host is OK? Not that I am complaining, but slow loading instances times will sometimes affect your placement in google and can damage your high-quality score if advertising and marketing with Adwords. Anyway I’m adding this RSS to my email and could look out for much more of your respective fascinating content. Make sure you update this again very soon.. Very good written article. It will be helpful to anyone who usess it, including myself. Keep doing what you are doing – for sure i will check out more posts. I do agree with all of the concepts you have presented to your post. They are very convincing and can certainly work. Still, the posts are too quick for novices. Could you please prolong them a bit from next time? Thank you for the post. My wife and i have been quite thrilled Emmanuel managed to deal with his analysis while using the ideas he got through your site. It is now and again perplexing to just be handing out instructions which usually the rest may have been making money from. We grasp we now have you to give thanks to because of that. These illustrations you’ve made, the easy website menu, the friendships you can help to promote – it is most astounding, and it is assisting our son in addition to us recognize that the matter is thrilling, which is rather important. Thank you for everything! Thank you a lot for sharing this with all folks you actually understand what you are speaking about! Bookmarked. Please also talk over with my web site =). We can have a link exchange arrangement between us! Simply want to say your article is as surprising. The clarity in your post is just cool and i could assume you are an expert on this subject. Well with your permission let me to grab your RSS feed to keep up to date with forthcoming post. Thanks a million and please carry on the gratifying work. Whats Going down i’m new to this, I stumbled upon this I have discovered It absolutely useful and it has aided me out loads. I am hoping to contribute & aid different customers like its helped me. Great job.